Welcome to The Museum Store! The only store of its kind on the Outer Banks, we feature historical gifts and collectibles that commemorate our representative sailing ship the Elizabeth II, American Indian Town and 400 years of Outer Banks history. In celebration of American crafts, we carry a wide variety of hand-blown glass, pottery, forged metal art, plus beautiful coastal-inspired silver and sea glass jewelry. 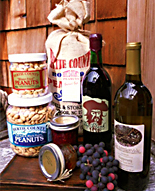 Be sure to browse some of our unique North Carolina pottery, soaps, leather goods, books and maps, as well as local delicacies such as wine, peanuts and jellies. We also have plenty of swords, hooks and pirate treasure for your little swashbuckler! Friends of Elizabeth II members always receive 20% off their purchases. Not yet a member? We can take care of that while you wait! 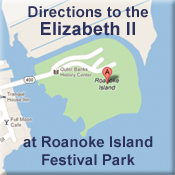 We are located at Roanoke Island Festival Park, a state historic site, just steps away from Manteo waterfront. The Museum Store is operated by Friends of Elizabeth II, a 501c3 support group. Proceeds from your purchases directly contribute to our efforts to restore, preserve, educate and provide programs for the Elizabeth II and Roanoke Island Festival Park. Receive your 20% discount on your purchase.